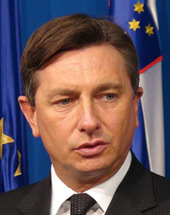 SARAJEVO – Western Balkans’ EU accession process has to become a priority for the new European Commission, and further delay of the accession process would only jeopardize the security and the whole process of European integration, warned the President of Slovenia Borut Pahor. Pahor tells Sky News EU short delay of Brexit possible. London, 2 March - President Borut Pahor, who recently concluded an official a visit to the UK this week, has said in an interview with Sky News that the EU member states could agree with a short postponement of Brexit. The European Commission president was spotted sporting a plaster on his cheek during a press conference with the Slovenian president Borut Pahor. Minutes before greeting Mrs May at the doors of the European Commission’s Berlaymont headquarters, Mr Juncker joked that the Prime Minister shouldn’t be blamed for his unfortunate injury.